The house is a renovated attic with a beautiful terrace with sea views and views over the rooftops of the quaint fishing village. Central location but quiet at the same time. Near to all the food shops and services. The beaches are located in the vicinity of the apartment. Free outdoor parking near the house. We spent a nice time in the flat though it got really cold outside (even snow). The conditioning system worked and there was everything we needed. The village is a genuine fishing village. 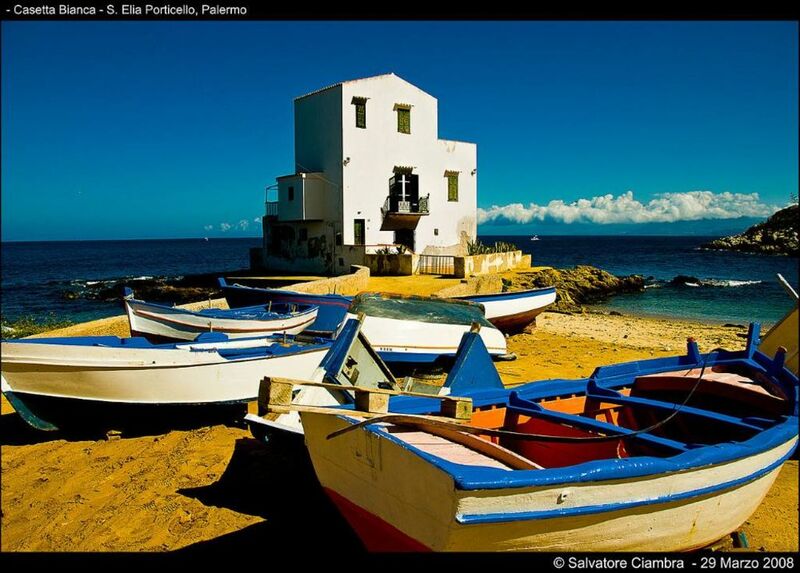 It is close to Palermo, so you can easily visit the city. But it is not too close, so you can also relax and enjoy the silence what was very important for us, to recover from the city stress (Berlin). It is worth to go on the hill next to the village to visit the Phoenician remains and have a great view to Palermo, Termini and Cefalú. We thank Daniele for the kind welcome an recommend the apartment warmly. Since we stayed during a low season it was not crowded. Actually it is a nice place and we felt like living not in a touristic apartment, but like in a cozy home. A terrace on a roof got a wonderful view to surroundings. The owner Daniele was really very friendly and showed us everything that was needed. In brief this is a place that probably we will come back one day. "It''s a wonderful place for quiet vacation!There were great location nearby sea,not far from railway station and supermarkets.The apartment was perfect, all view from windows - just sea!The hosts were so kind and leave us all information about transport connection with close towns!Grazie mille,Daniele and Annalisa!" "I really enjoyed my stay in this flat very much. Very comfortable appartment includes everything you may need on daily basis during your holiday. It was pleasure to eat on the balcony with very pictoresque view over charming fishermen village of Porticello. You can also relax on the terrace with breathtaking view on seaside and Solunto mountains on both sides. Building is in perfect location, both very cosy and close to shop, vegetable market, kiosk etc. Don''t hesitate to visit nearby Serenella gelateria for wonderful pistacchio ice-cream." L'appartement est totalement rénové décoré et équipé et idéalement situé. Une vue magnifique du balcon sur la mer et le port, et de la terrasse de toit on peut voir toute la côte et les montagnes. Daniele nous a très bien accueillis et conseillé sur les activités régionales. Pour visiter Palerme, sur ses conseils, nous avons pris le train qui en 20 minutes nous dépose au centre historique, sans l'angoisse automobile dans Palerme. Santa Flavia est un excellent point de départ pour visiter tout le Nord ouest de la Sicile. Merci pour cette semaine. Schöne Ferienwohnung in typisch sizilianischer Kleinstadt am Meer gelegen. Zu Fuß 5 min zum Meer, mit dem Auto ist man in 30 min in Palermo. Schöne Strände nicht weit von dort. Die Wohnung überzeugt durch ihren Preis und die wunderbare Dachterasse mit Sicht auf die Umgebung. Sonst einfach eingerichtet, mit dem Nötigsten. Anfahrt mit dem Auto nicht so einfach, wir empfehlen das Auto erstmal am Hafen stehen zu lassen, da es durch die engen Gassen schwierig ist zu orientieren... lediglich Bettwäsche und Handtücher sind nicht im Preis inbegriffen. Sehr nette Vermieter. Können die Wohnung nur weiterempfehlen. Palermo / airport take the motorway A19 direction Messina. Casteldaccia exit and continue for Porticello. With the train from Palermo to get off at Santa Flavia. for lovers of fine Sicilian cuisine there are renowned restaurants. For lovers of archeology, it is recommended that the archaeological site of Solunto, Punic town over the village. Tariffe scontate in relazione alla durata, Caparra richiesta alla prenotazione, Consegna delle chiavi da parte del Proprietario non presente in loco, Proprietario non presente in loco. Supplemento per energia riscaldamento solo nel periodo invernale( dicembre- marzo 10,00 euro al giorno, 50 euro a settimana da pagare in loco all'arrivo.